Afrikasi Kenya CBO is a duly registered non-profit organization that specializes in educational sponsorship for the needy and disadvantaged school going children and young adults from pre-school to University mainly from the Deep Sea slums. 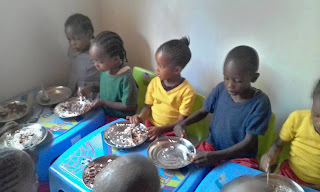 Afrikasi Kenya also runs a fully fledged Child Care Center called Afrikasi Kindergarten based in Lower Kabete that offers subsidized quality education to the needy nursery going children mainly from DeepSea slums and the neighbouring environs. The Afrikasi Kenya CBO Kindergarten 2018 Pre-primary Graduation ceremony was full of pomp, colour and lots of entertainment by the pupils as well as excitement and pride. 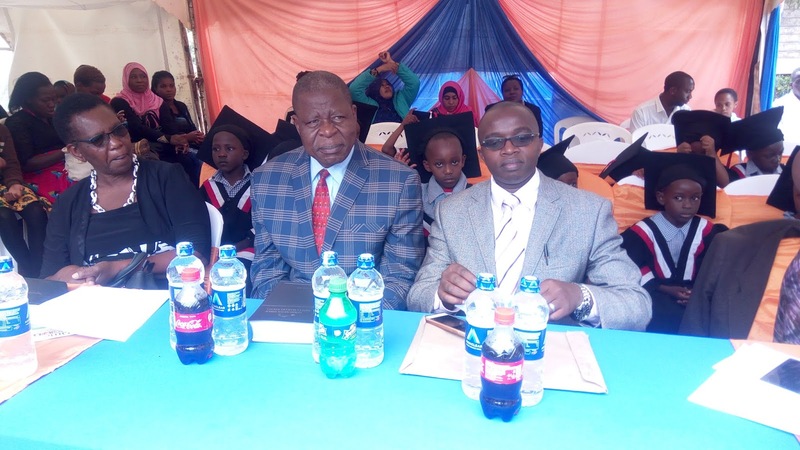 The ceremony was presided over by Mrs. Rose Mureu (former Head Teacher of Dr. Ribeiro, Parklands Primary School), Dennis Muriuki (Motivational Speaker, Life Coach and Counselor) as well as Bishop Abraham Singh Madegwa of Evangelical Friends International Church Kenya. 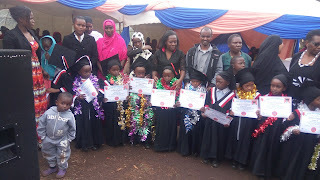 This is the 8th graduation ceremony that Afrikasi Kenya CBO Kindergarten was holding since its inception. 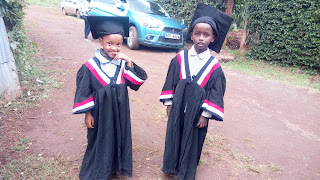 The graduands entertained the guests who included pupils of the Kindergarten, parents and relatives of the pupils, some board members of Afrikasi Kenya Community Based Organization, Guest Speakers, paparazzi, Afrikasi Kindergarten alumni and well-wishers with songs, dance and poems. It was evident from their performances that the graduands were intelligent and well-schooled pupils who were ready to go on to grade 1. In fact all of them had qualified and had secured places in top Public Primary schools of mainly Dr. Ribeiro Parklands Primary School, Westlands Primary, Highridge Primary as well as Aga khan Primary School. Considering the fact that these graduands live in Deepsea slums where the living conditions are harsh to say the least, they had come a long and challenging journey to become proud scholars and achievers. After entertainment by the pupils of Afrikasi Kenya CBO Kindergarten Bishop Abraham Singh gave a captivating sermon mostly on how to raise God fearing, educated and healthy children in a clean and non-violent environment. He also emphasized the need for parents to be exemplary to their children by avoiding vices like smoking, drinking, and promiscuity e.t.c. The Bishop then went ahead to pray for and bless the graduands and their parents as well as teachers to continue the hard work and succeed in their endeavors. Mr. Dennis Muriuki’s speech stressed the importance of education and how educating a child is the best gift a parent can give them. He advised the parents to sacrifice everything they had including shambas in order to educate their children so as to be able to enjoy their later years. He was also proud of the young scholars because he was familiar with the slum were they resided having worked in Deepsea slum as a youth counselor. Mrs. Mureu talked about how poverty of the mind and poor attitudes deterred mainly residents of slums from developing and educating their children. She urged the parents present not to be lazy but work hard to educate their children most especially providing them with the necessary materials to attend school and not to depend on hand outs. She also emphasized that children needed security from their parents who should not leave them alone in the houses without adult supervision. The class teachers (Everlyne Were, Irene Ngata and Emily Achieng’) also addressed the guests present. They were so proud of their pupils and they demonstrated to their parents how they had greatly improved from the time they started school to the time now that they were finishing school. They were concerned that some parents were not playing their part in the participation of their children’s education and were leaving everything to the teachers. 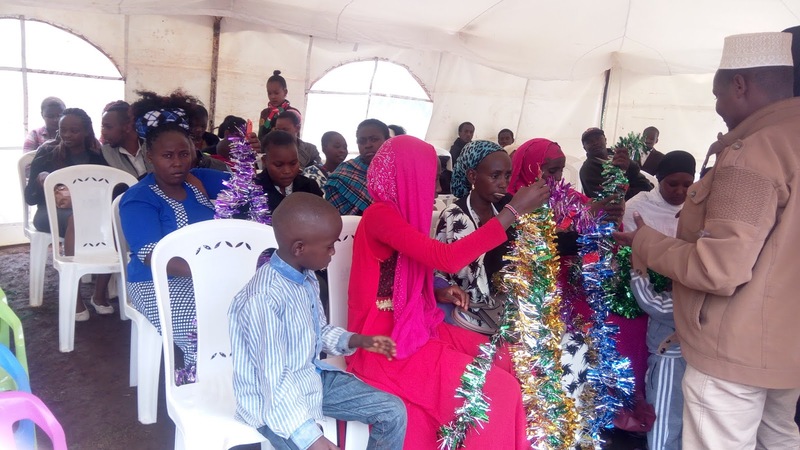 They also urged the parents to protect and look after the young ones so that when they come back to school after the long holidays they will have no scars or bruises on their bodies as it had been observed whenever pupils came back to school after school breaks. Teacher Emily was especially emotional because she was saying bye to her pupils who were going to graduate and go to other schools for their grade one. 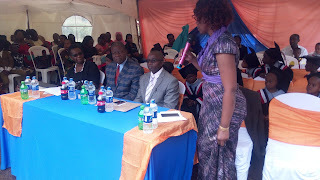 Margaret Mbai Odeke the Programs Coordinator who was also Master of Ceremonies thanked the parents for their efforts and participation in the education of their children. She particularly recalled how tough the journey had been, thanking God for the far the school had come. She informed the parents that the Primary school, Secondary and University sponsorship projects had stalled due to the absence of a Donor but needed to be revived as many students back in DeepSea Slum were still suffering because of the vacuum that had been created since January 2018. She also stressed the importance of setting a good and firm foundation for children, by admitting them in quality Nursery schools / E.C.D.E centers like Afrikasi Kenya. She likened this to the builders of the high storied buildings. The ones constructed on a shaky foundation will eventually collapse but the ones built on a strong foundation will stand forever. She also regretted the fact that the school was ‘giving away’ very well molded and bright children to other schools as opposed to retaining them by starting a Primary section. She called upon Mrs. Mureu and other Educationists present to partner with the C.B.O to enable this dream come true. After the speeches, the graduands were awarded their certificates as well as more presents that the parents had organized for them. The teachers were also not left out as the parents awarded them also with presents for their good work. The function was crowned with the cutting of a beautiful cake by the graduands and everyone was invited for lunch. Margaret Odeke gave a vote of thanks and also conveyed the Chairman of Afrikasi Kenya CBO’s apologies for not attending the function due to unavoidable circumstances but he was able to send the presents that were awarded to the pupils who excelled in academics, sports, cleanliness, discipline, music and drama, creativity and many more. Afrikasi Kenya Kindergarten which is one of the show case projects of Afrikasi Kenya C.B.O was founded in 2016 to cater mainly for the needy and disadvantaged children from the Deep Sea slums but outside the slum environment so that they can be exposed to the other side of life and slowly erase the ‘slum’ mentality. Currently the Kindergarten has a total of 70 children, 90% of whom come from the Deepsea Slums. The rest are from the lower Kabete and the neighboring environs. The Kindergarten provides a unique, serene, peaceful and clean environment for the children, a well balanced diet feeding program which includes tea break and lunch, neat classrooms, sporting and co-curricular activities and very competent Early Childhood Development Education (ECDE) qualified teachers. It also provides very subsidized fees because it mainly caters for children from disadvantaged and needy families. 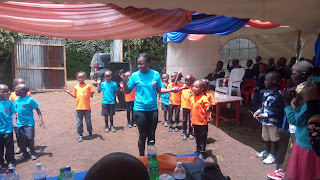 Afrikasi Kenya Community Based Organization is a duly registered non-profit organization that specializes in education sponsorship and operates mainly in Deepsea Slum, Highridge area in Nairobi. 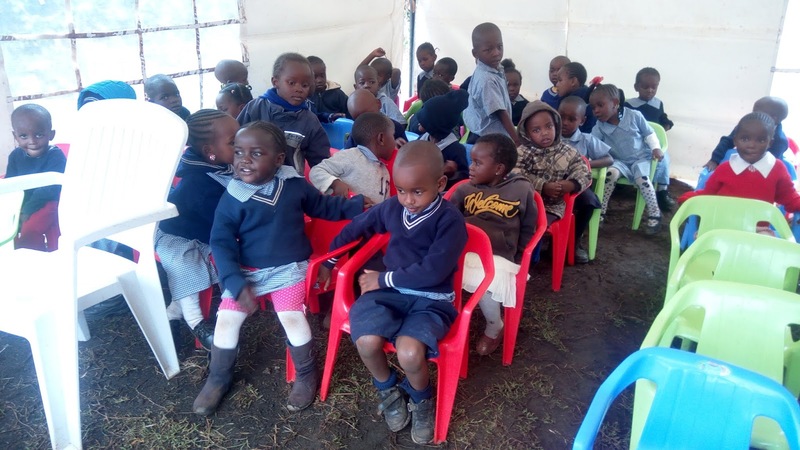 Afrikasi Kenya CBO runs an ECD (Early Childhood Development) Centre called Afrikasi Kenya Kindergarten that offers quality education to over 70 needy and disadvantaged children from the Deepsea Slum aged 3 – 6 years old. 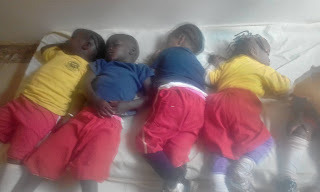 At this Kindergarten we run a feeding program where we provide two meals to the children i.e. porridge and a snack and lunch. The children consume the following food per month. No. Food Item Quantity per day Per week Per month 1. Unga (Maize Flour) 6 kgs of Unga for 2 days 12 kgs 48 kgs 2. Uji (Porridge) 2 kg per day for 5 days 10 kgs 40 kgs 3.